Bands perform scary shows all the time. But what about the venues themselves? Are there live music haunts in Chicago that play host to local ghosts and spirits who are waiting for one more encore from the band? Yes, Chicago’s live music venues do have a spooky history, and to continue our Halloween celebration this year, we spoke with a paranormal pro to see what venues have the scariest live music fans still hanging around the stage and lurking in the balcony. We’ll begin our special Halloween exploration into haunted Chicago music venues by talking with author and owner of Chicago Hauntings Ursula Bielski. Then we’ll take a look at a few more local Chicago haunted music venues and explore some paranormal concert scenarios you should think about before your next show. 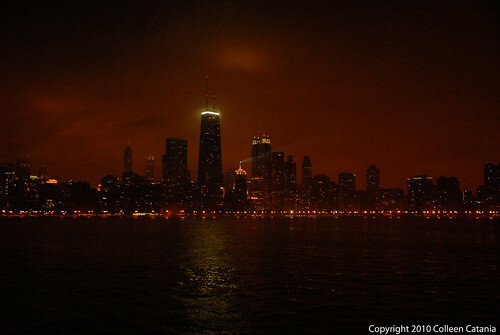 Bielski’s written several books on ghost sightings and paranormal history in the Windy City. And on special ghost tours like the Pub Crawl, Bielski guides curious ghost seekers through venues around Chicago such as the legendary jazz club Green Mill. Here’s what she said when we asked her if she had heard of any stories of hauntings at popular venues like Metro, The Aragon Ballroom, or The Vic Theater. “I have not found any stories about the Aragon, try as I have for many years, but the nearby Green Mill is a place where hauntings are reported, going back to gangland days when it was one of Capone’s favorite places to enjoy music. To Bielski’s point, this SunTimes report notes the following details that were investigated by T.A.P.S. during their visit at the Congress Theater. A video of the show is below. An aisle, where a woman in a blue dress paces before disappearing. The basement, where people have heard ghostly foosteps behind them. The stage, where there have been reports of an apparition of a man raising his arm. The Congress Theater was built in the ’20s, and Houdini performed at the palace in the ’30s. Local lore has it that the mob used to meet in the basement. If that kind of stuff is going on at the Congress Theater, then I wonder how those ghosts enjoyed, or if any of them showed up to this Girl Talk NYE 2009 concert? Without a doubt, Bielski’s research makes me wonder more, and think differently, about some of favorite Vic Theater shows such as M. Ward and Cold War Kids. What live music venue does Bielski think has the highest scare factor? Showing her spooky sense of humor she says, “This would have be any of the jazz shows at the Green Mill, where you’re not allowed to talk during the performances, even though it’s a cocktail lounge. I am quite sure the bouncer would be happy to kill anyone who doesn’t shut up–and maybe already has. In her books , Bielski documents the spooky and creepy history around the Windy City. And she also had this to say about one of my favorite venues, the Metro on Clark St., formerly called the Cabaret Metro. “Patrons report the ghost of a 2-year old boy who was reportedly killed in an elevator accident there in 1945, who manifests in the form of strange lights and cold spots, and occasionally as a fully formed apparition. I don’t know about you, but I think of little Gage who was killed by the truck in “Pet Sematary.” Yikes. We thank Ursula for taking the time to share her stories with us. You can check out her excellent books on Amazon. And get more info her award-winning ghost tours on Chicago Hauntings. If you need more tales to satisfy your spooky fix for haunted Chicago venues ghost, here’s a few more links about Excalibur and other local bars with reported ghost sightings. All this haunted concert venue talk has got me wondering about a few things. What have these ghosts at The Vic, The Green Mill, Metro and the Congress Theater thought of the shows? Have they been contributed to the performances in ways that fans have not noticed? Have they contributed to the Little Things? Have the ghosts and paranormal energy ever influenced a band’s performance? How does the rock music of the living impact the energy of the dead as they float about the buildings and stages? Are these reported ghost sightings the result of bad shows or poor performances, or do the sightings increase before or after a show? Are these sightings the ghost’s way of saying they love, or hate the band’s at the venues? Like our tribute to John Lennon, and all the concert fans who’ve died recently, I wonder if any of them have gone back to hang out at their favorite concert venues. If we were to interview one of these ghosts that were sighted, what would they say about the shows they’ve seen? What About You? Does This Scare You? Have you ever experienced paranormal activity at one of these concert haunts? Have you ever seen a ghost at a concert before? Thank you for this informative article about hauntings at live music venues in Chicago. I have also explored the paranormal with the Chicago Ghost Hunters Group at many Chicago locations including theaters, hotels, cafes and pubs. I was just at the Vic last night and something weird kept happening to me. I felt it multiple time while at the show. I kept feeling some one blowing into my hair. I’d keep looking too see if someone was right to my rear right side, but no one was there! It wasn’t a draft, it was definitely more like someone blowing. There was a girl right behind me, but more on the left side, and I don’t know why she’d be blowing at my head, and on the opposite side. Weird!